With unmistakeable appeal and an instantly noticeable presence, the Vauxhall Insignia Sports Tourer is the luxurious estate that performs as well as it looks. As a sister model to the Grand Sport, the Insignia Sports Tourer emphasises practicality while keeping the same trademark good looks. Driving the Insignia Sports Tourer will be a head-turning experience, thanks in no small part to exquisite details such as the large alloy wheels, confident LED headlights and boldly curved styling that emphasise aerodynamics. The Insignia Sports Tourer holds a whole world of luxury inside, with exciting plush upholstery and carefully designed relaxing seats for driver and passengers alike. Versatile and practical as well, the Insignia Sports Tourer is spacious by default, with 530 litres of boot space, which can be topped up to 1,470 litres once the rear seats are folded. The Vauxhall Insignia Sports Tourer delivers the performance that its appearances promise, thanks to a range of three petrol and three diesel units to choose from. All-Wheel Drive is also available for the Insignia Sports Tourer, ensuring that nothing will get left behind on any journey. Pick the frugal 1.6-litre 110PS diesel unit and you will benefit from returns of up to 70mpg and as little emissions as 105g/km. Choose the more power-hungry 2.0-litre 260PS petrol engine available on select trims instead and you will find yourself at 60mph in just 7.1 seconds. Technology has rarely been this helpful. Featuring not only class-leading entertainment and connectivity delivered through the Intellilink touchscreen infotainment system, the Vauxhall Insignia also emphasises convenience for all occupants, with features such as Keyless entry, Engine Start/Stop and air conditioning available. Passive safety features available include features such as Adaptive Cruise Control, AEB and a convenient heads-up display. Alongside a comprehensive set of airbags, these systems have earned the Insignia Sports Tourer a five-star Euro NCAP rating. 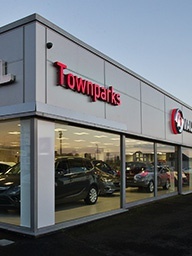 Get in touch with Townparks Vauxhall in Northern Ireland today to learn more about the current generation of the Vauxhall Insignia Sports Tourer and book your test drive. Ring the displayed number or fill in the available enquiry form and we will reach out to you shortly.